The tours run every day from May to October. 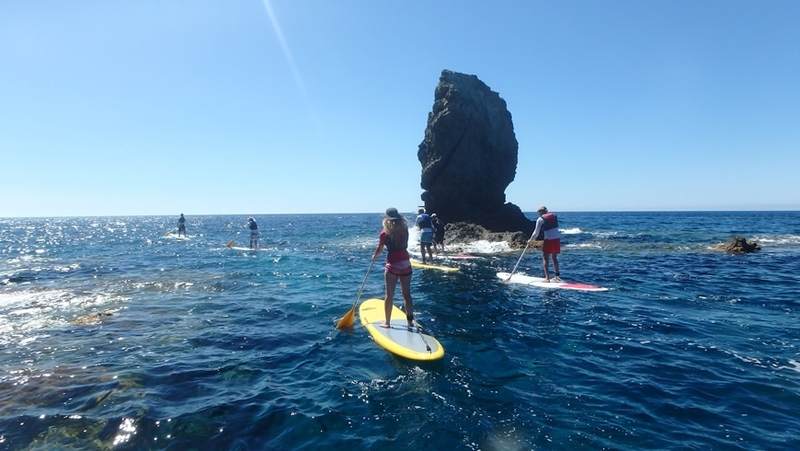 Have the chance to admire the south coast of the island whilst trying to balance on your SUP! Our guides will pick you up from your hotel and drive to Mesa Pigadia, one of the most unspoiled beaches of the island. 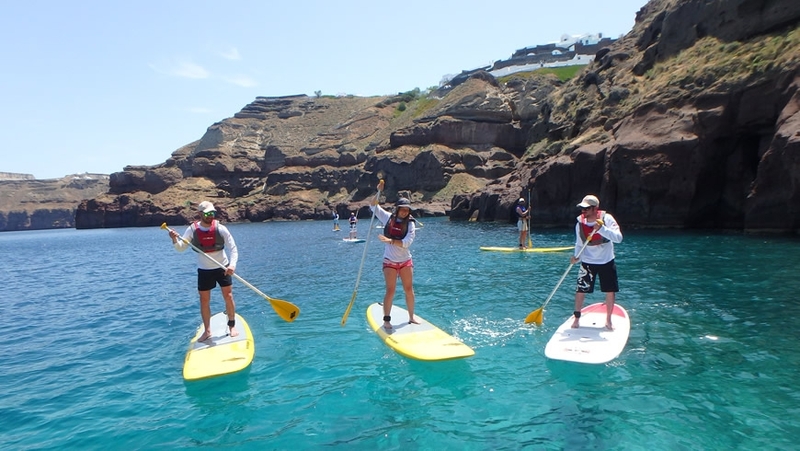 After an introductory course (for beginners) and accompanied by an experienced guide you will try to paddle standing on your board. A lot of fun and swimming and snorkeling! Experienced participants board and discover the very interesting coastline of Santorini island due to its volcanic nature.You will pass close to the white beach, the red beach and you will enter the so called “Indian Bay”. End your day enjoying a traditional and nutritious picnic lunch with local products on a secluded beach and be ready to paddle back to the starting point of the activity! The maximum number of participants for the tours is 10. All SUP tours offered by “Trekking Hellas Sea Kayak” can be booked securely and safely with our online booking system. Explore the untouched south coast of Santorini! Paddle across unique beaches – red, white and black sanded. Enter magnificent sea caves, swim, snorkel and enjoy a picnic by the sea. End your activity with a relaxing meal by the sea at Mesa Pigadia. Approximate pick up and drop off times depending on where you are staying: 09:00-14:00. Something to remember! Enjoy the famous Santorinian sunset from the sea level while admiring the white beach, the black beach and the lighthouse that overlooks the caldera. End your day with a relaxing meal by the sea at Mesa Pigadia. Approximate pick up and drop off times depending on where you are staying: 16:00-21:00. Ready to book? Just fill out our secure form below, giving us three date/time preferences and we will contact you to confirm your booking and give specific pick-up points and times. 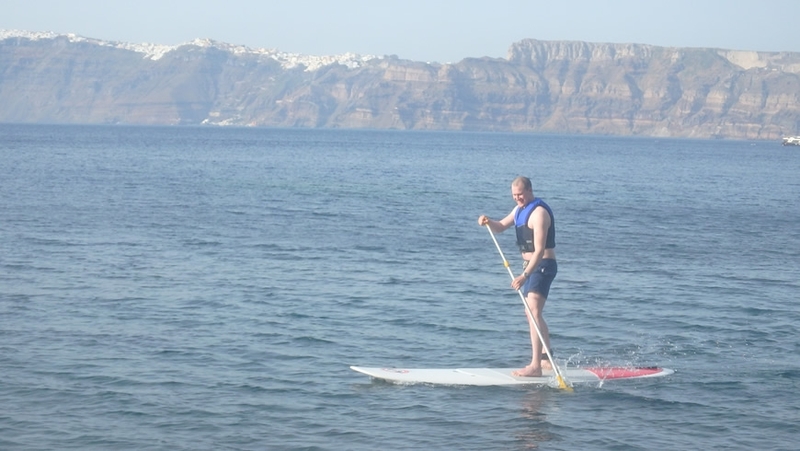 Please kindly keep in mind that Stand Up Paddling by Trekking Hellas does not accept credit card payments. When booking, please provide us with your credit/debit card details for security purposes. Your card will only be charged in case of last minute (less than 3 days) cancellation or no-show. Payment of the tour is to be made in cash on the day of the tour. Do you have any questions, contact our team at tours@santorini.net!